NASSAU, Bahamas (AP) — Jon Rahm broke into tears when he beat Tiger Woods in the Ryder Cup, the most meaningful moment of his career. 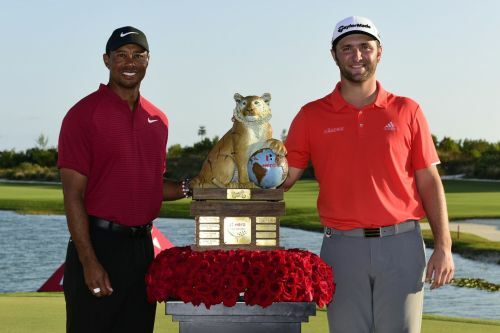 Sunday wasn't bad either, not with Woods handing him the trophy after Rahm turned a potential shootout into a runaway victory on the back nine in the Bahamas to end his year by winning the Hero World Challenge. That makes two full years as a pro for the 24-year-old Spaniard, each with three victories worldwide. "I hope I keep winning three times every year," Rahm said. "Still wouldn't get to what Tiger's done in 20 years, but it would be pretty impressive." Starting the final round in a three-way tie with Tony Finau and Henrik Stenson, Rahm took the lead for good on the eighth hole and never trailed again. Finau was his final challenger until he took double bogey on the par-4 14th hole as Rahm made birdie for a five-shot lead, and the rest was easy. Rahm closed with a 7-under 65 for a four-shot victory at Albany Golf Club. "Even if I make a 4 there, I'm going to have to do something pretty dang special," Finau said. "Hats off to Jon this week. He played incredible golf, and he deserved to win this week." Woods was never in the picture until it was time to hand out the trophy. Woods got off to another rough start, rallied on the back nine and had to settle for a 1-over 73 to finish 17th against the 18-man field. He finished 19 shots behind, the biggest gap this year from the winner over 72 holes. "Overall, it was a long week, but one that I hope the players enjoyed," Woods said in his role as tournament host. Even so, there were Tiger prints all over this victory. Rahm spoke of an interview he once saw from the British Open when Woods said that when he took the lead, his goal was to never go back to the field. "That's the same thing I thought today," Rahm said. "As soon as I got in the lead, my mind was still forward. Keep doing birdies and just keep going on. I didn't know what kind of a lead I had until I got to 16, and I was still rifling at the pin." He also recalled running into Woods before the Tour Championship at East Lake, which Woods won for his 80th career victory. Rahm grew up on poa annua greens, still isn't entirely comfortable on Bermuda and asked Woods for advice. "He kind of laughed and told me it's all about feel," Rahm said. "I was like, 'OK, whatever, right.' And today out there with the trophy, he was like, 'That's a pretty good performance for somebody who can't put putt on Bermuda greens.' I think I made one putt outside 10 feet. I didn't miss a shot the last three days, it's as simple as that. But I don't think he believed me." Rahm has said all week the key to Albany were the five par 5s and two reachable par 4s. He made birdie on all of them Sunday. Even with a runaway victory, there was a small measure of drama on the final hole. Justin Rose, needing to finish in a three-way tie for second to return to No. 1 in the world, closed with a 65 and was in position to go back to the top of the ranking until Finau rolled in a 10-foot birdie putt for a 69 to finish alone in second. Brooks Koepka, who did not play this week, remains No. 1. Rose has one more event left in two weeks at the Indonesia Masters. Finau, meanwhile, cracked the top 10 for the first time in his career at No. 9. Rahm took a two-shot lead to the back nine with a 4-hybrid to 12 feet on the par-5 ninth that set up a two-putt birdie, and he held his own until Finau's double bogey. Rahm, making his first trip to the Bahamas for this event, figured out early that the key to scoring at Albany were the five par 5s and two reachable par 4s. He made birdie on all seven of those holes Sunday. Stenson was only one shot behind when he made the turn, but the Swede made only one birdie on the back nine and finished alone if fourth. Patrick Cantlay was 12 shots better than Saturday, closing with a 64 to tie for fifth with defending champion Rickie Fowler. Rahm: I'd bet on myself - but McIlroy looks unbelievable!